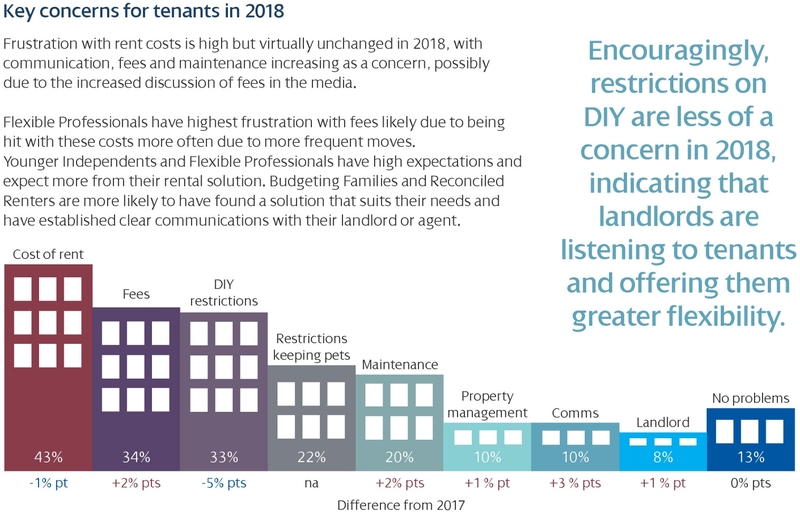 PRSim’s Tenant Survey (2018) finds that tenants remain as frustrated with the high rent costs as they were in 2017. Tenants were however increasingly concerned by issues with communications, fees and maintenance. The report suggests that Flexible Professionals (FPs) are most frustrated by fees as a result of frequent moves, for which fees may be payable. Younger Independents (YIs) and Flexible Professionals (FPs) have the highest expectations from their rental solutions. Budgeting Families (BF) and Reconciled Renters (RR) are the most likely to have found rental solutions that meet their needs. Interestingly, DIY restrictions are less of a concern in 2018. This may indicate that landlords are listening to tenants and offering greater flexibility.